The E-SYSTEM EVO is a system gas boiler coming in the output of 30kW. This boiler is highly efficient with it being A rated and having the efficiency rating of 90.2%. It is a natural gas boiler but is also compatible with LPG and conversion kits are available on request. This boiler has a range of wired and wireless controls available and comes with an auto- diagnostic system to help protect your boiler and tell you what the issue with the boiler is in the unlikely event that it goes wrong. This boiler comes with a built in automatic by-pass to help keep your flow rate going, as well as a stainless steel heat exchanger and three temperature zone capability. The E-SYSTEM EVO also comes with auto function technology meaning that your boiler will be more energy efficient (helping you to save money), be able to heat a room up faster and assure that your home is a comfortable temperature all the time. 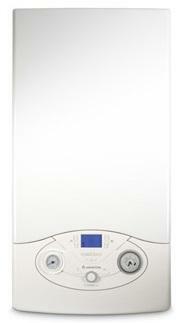 This boiler is also available in the output of 24kW and comes with a 2 year warranty.